The Israeli demand for a security presence along the Jordan River was again raised last month in the Kerry-brokered peace talks between Israel and the Palestinians. Its objective would be to stop Palestinian and global jihad terrorists from infiltrating into Israeli territory and to prevent the smuggling of rockets, explosives and other weapons which would be used by the Palestinians to attack Israel along its eastern border. The Jordan River border east of Israel becomes especially important, as the Arab Spring fades into a Winter of Chaos, creating uncertainty about future in neighboring Arab states to the east of Israel. These Arab states likely will be destabilized and their identities will change, influencing their objectives and leading to an increase in hostility and preparations for future aggression against Israel. The threat is worsened by the rise in power of radical Sunnis in the Arab countries seeking to take over regimes whose hostility toward Israel is legendary, but still less than that of the Sunni extremists trying to overthrow them. The regimes (among them the monarchies like Jordan and the Gulf States that survived the Arab Spring) are uncertain and worried by dissent and the threats to their stability, and are currently preparing for the worst case scenario, that is, a putsch. That situation brings Israel into the equation, especially in view of Iran's ongoing threat to destroy it. Israel cannot ignore the axis of hostile Shi'ite regimes – from Tehran and Baghdad to Damascus and Beirut – currently forming and closing Jordan and Israel from the north and east. For years, Israel's threatened eastern border has been in a state of military preparedness, fearing the arrival of forces from Iraq and other Islamic countries..
Israel's eastern border is difficult to defend because of its geostrategic structure, being Israel's "narrow waist" of 12 kilometers, or barely 7.5 miles. Israel's center, which is its most densely populated urban area, has no depth. A military or terrorist attack against Israel from the east would expose not only most of the population but main strategic facilities (military, industrial and civilian) to an unprecedented threat. 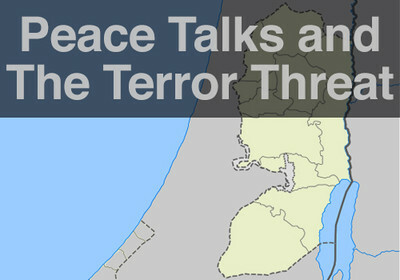 Controlling the Jordan River corridor, demanded by Israel as part of the peace agreement with the Palestinians, would provide a partial, but insufficient solution by creating a buffer zone which would prevent Palestinian terrorists and offensive weapons from entering the area, and increased response time in the event of a future ground attack. Israel's demand for control over the Jordan valley is the result of Egypt's recent bitter experience with its Gaza Strip border in Rafah. Despite the Oslo Accords with their provision for the cessation of hostilities, and despite the negotiated peace agreement, and despite Israel's unilateral withdrawal from the Gaza Strip (now not subjected to any form of occupation whatsoever), Palestinians attack civilian Israeli targets with rockets, anti-tank missiles, mortar shells, sniper rifles, assault rifles, knives, cars, front loaders, stones, Molotov cocktails, IEDs and EFPs, car bombs, pipe bombs and remote-controlled bombs. Attacks against Israel from both Gaza and the Sinai Peninsula increased exponentially once the PLO's rule of the Gaza Strip collapsed and was replaced by an independent Palestinian regime run by the Islamist terrorist organization Hamas. What happened in Gaza can easily happen again in Judea and Samaria. According to their rivals, Mahmoud Abbas and the Palestinian Authority do not enjoy a legal consensus, and their opponents in Judea, Samaria and Gaza claim that any agreement signed by the Palestinian Authority isn't worth the paper it is written on because the Palestinian Authority does not enjoy either legal status or grassroots support. Egypt, in spite of its peace agreement with Israel, turned a blind eye to the passage of terrorists and weapons streaming into the Gaza Strip to attack Israel. Currently the Egyptian government is trying to eradicate terrorism in the Sinai Peninsula, but its questionable success makes it imperative to ask about the ability of Jordan, a friendly country, to prevent terrorists and weapons from entering Judea and Samaria from the east. Jordan was one of Israel's worst security headaches during the 1970s, and the IDF pursued hundreds of terrorists from Jordan who crossed the river to carry out atrocities against Israeli civilians. Members of the Israeli security establishment disagree regarding the value of the settlements strung along the Jordan River corridor and their contribution to the defense of Israel. Veterans of the old "tower and stockade" settlements that founded the Jewish Yishuv in a sea of Arab hatred and hostility before the State of Israel was established in1948 claim that the settlements are themselves a permanent defensive system, based on agriculture and peopled by idealists with tremendous motivation to withstand the perils of confrontation. Their basic assumption is that settlers provide an initial operative military response in halting attacks. That approach relates to the settlements as a fundamental, critical asset in the daily logistics of military forces operating in a supportive environment instead of a hostile region which will immediately be created in the vacuum left by the evacuation of the settlements. Opponents claim that the settlements lying along the Jordan River corridor have no operative value, and in a military confrontation will only burden the security forces, which will have to defend and secure them, and evacuate the civilians (women and children). That is what happened in 1973 when the Syrians invaded the Golan Heights settlements during the Yom Kippur War. All the Israeli civilians in settlements would have to be evacuated from their own country being, unfortunately, the designated targets of Islamist terrorism, as are Tel Aviv and the Ben-Gurion International Airport. As part of a proposed final status agreement, the Palestinian state will be demilitarized and not have military security forces. But the Palestinians are trying to ensure that their future state will have all the trappings of sovereignty, including weapons for "self defense." One way or another, they do not accept Israel's demand to control the Jordan River crossings, the skies over Judea and Samaria, and the eastern border, and continue to plot a political campaign that will isolate Israel and represent it as an obstacle to peace. All the signs indicate that neither Jordan nor Israel is eager to place the Jordan River corridor in Palestinian or international hands. The Jordanians have not forgotten how the Palestinians under Arafat tried to depose King Hussein, and the fierce battles waged against them during the "Black September" of 1970, which led to the expulsion of the leaders of the Palestinian terrorist organizations from Jordan to Lebanon. Jordan, most of whose population is Palestinian, is aware of the potential dangers of a Jordanian-Palestinian contact line along the Jordan River. Likewise, the Israelis have not forgotten how the Palestinians crossed the Jordan on foot to slaughter Israeli families, their creativity in putting weapons and explosives in double doors and car tires. Thus the Israelis will not agree to Palestinian or international oversight of the Jordan River corridor. They learned the hard way that only the IDF can provide security. The collective memory of Israel's leaders is hard-wired not to forget the conduct of foreign observers in various past conflict arenas, and how they fled at the first hint of fighting, abandoning their posts and jettisoning the mandate they had received. Israel and Jordan have a mutual interest in overseeing the water line between them in its present form as they consider the pretensions to sovereignty of the planned Palestinian state, which so far has proved itself as generally unreliable. Many long years of building trust have to pass before terrorism, cynically referred to as "resistance," ceases to serve as a realistic and legitimate option for the Palestinians. Many long years of building trust will have to pass before the series of defaults, lapses. Many long years of building trust will have to pass before Israel forgets that the first thing Yasser Arafat, winner of the Nobel Peace Prize, did when he set foot in the Gaza Strip after the Oslo Accords was to smuggle terrorists and weapons in his own car, in direct violation of the agreement. Abbas's Palestinian Authority continues to sanctify terrorism, to name town squares for "martyrs" like Dalal Mughrabi (one of the terrorists who murdered 38 Israeli civilians on a bus in 1978), and to joyously receive released terrorist prisoners as "heroes." Can that Palestinian Authority leadership seriously be expected to patrol the Jordan River corridor and stem the tide of Islamist terrorists and their weapons who come from all over the world to wage jihad against Israel? Israel is deeply mourning the death of former Prime Minister Ariel Sharon, a war hero and a daring political leader who devoted his life to serving the State of Israel. Before he lapsed into a coma eight years ago, George W. Bush wrote him saying that the solution to the problem of the Palestinian refugee camps was to settle them only in the future Palestinian state, that the border of that state should be determined according to Israel's security needs with an eye to Israel's main population centers, and that Israel not be required to withdraw to the Green Line. Abbas says that he will control security in the Jordan River corridor, but what he more likely will do is give a free pass to terrorists and weapons on their way to the Palestinian Authority targeting Israeli civilians and territories. There is an old Arab saying, hamiha harmiha, "The guard and the thief are one and the same." The "miracle of peace" Abbas is trying to market to an unfortunately gullible international community is nothing but fraud and slight-of-hand. He continues to harp – endlessly – on the so-called "right of return" of the Palestinians to the territory of the State of Israel, refuses out of hand to recognize the State of Israel as the homeland of the Jewish people, and has added a snag to the already twisted Gordion Knot of negotiations by demanding control of the Jordan River corridor. He doesn't intend to end the conflict and he is not planning to establish peace and coexistence with the State of Israel. He is planning to inundate it with a tidal wave of terrorism. Dr. Reuven Berko has a PhD in Middle Eastern studies, is a commentator on Israeli Arabic TV, writes for the Israeli daily newspaper Israel Hayom and is considered one of Israel's top experts on Arab affairs. "Egypt, in spite of its peace agreement with Israel, turned a blind eye to the passage of terrorists and weapons streaming into the Gaza Strip to attack Israel. Currently the Egyptian government is trying to eradicate terrorism in the Sinai Peninsula, but its questionable success makes it imperative to ask about the ability of Jordan, a friendly country, to prevent terrorists and weapons from entering Judea and Samaria from the east." .......This statement is very naive, because this is exactly one of the reasons Morsi was overthrown, because of his cooperation with Hamas and agreement with Ayman Al-Zawahiri to establish training camps in Libya and North Sinai with revolving doors between them and Syria. Under the new interim government Israel and Egypt have the best cooperation in decades. and the "questionableness" of Egypt to succeed in North Sinai against Al Qaeda is dependent upon Israels exceptions to Camp David and allowing Egypt to have military operations in the Sinai, and the US to keep it's part of the Camp David agreement with providing military aid, which the US has denied Egypt since the overthrow of Morsi. Palestine will NEVER demilitarize. I just love these reports from academia that are out of touch with what is really happening on the ground. With all due respect to Dr. Berko and his credentials, he writes in generalities regarding Israel's eastern border and the politics of the region, vice substantial, factual, relevant and current terrorism threats. He makes sweeping statements about Israel's borders being difficult to defend and uncertain in the future of what lies to the east of Israel. The article insinuates that Jordan is a future threat by using events from more than 40 years ago. In my recent years of experience living, researching terrorism and working in Jordan, this is simply not true. The Jordan Valley corridor is currently secure by both Israeili/Jordanain cooperation and all indications politically are that the relation remains strong and viable for the future. On a side note, the Jordan valley corridor is critical to water in the region and thus holds sway to the one who controls it. The majority of the eastern border with Jordan is jointly protected - Israel and Jordan have a strong working relationship regarding security and a viable peace agreement since 1994 - the agreement has not been threatened by any of the uprisings in other Arab nations and Palestine was not affected either. Jordan was not involved in the Arab Spring - as seen from the perspective of someone who lives here, there has been normal "demonstrations", gatherings of people who want their voice heard like in all free & open countries. In the big scheme of things, these demonstrations have never threatened the leadership of the Hashemite Kingdom nor is the government worried that its citizens are on the verge of an uprising. Jordan's security forces along the borders with Palestine (West Bank), Syria and Iraq are very good. These forces continue to receive training and assistance from many other nations, in particular the US. This being said, there is no truth in comments about Iraqi terrorists reaching Israel by going across Jordan or that Shi'a governments are closing with Israel -- there is no new Shi'a players in this region, simply the Alawite sect of Syria (current government) and Hezballah in Lebanon are the biggest influencers. Jordan security works diligently to prevent entry or transit of weapons or fighters from Iraq or Syria in the current environment to travel to Israel. Jordan continues to work for improvements to regional security. As far as the West Bank is concerned being a threat, The US currently supports the National Security Forces of Palestine in cooperation with Israel to grow their security forces to eventually be self-sufficient, as Israel is in control of this territory and continues to coordinate with these same security forces. There are potentially small groups who may cause minor problems within, however the majority of Israel's terrorism concern should focus to the North with Hezballah in southern Lebanon, remnants of the PLO and other radical off-shoot groups who operate in Lebanon and Syria, and to the south with Hamas in the Gaza Strip; where all recent security problems have emulated. This section of Palestine should not be made out to be a cooperative piece of the Palestinian Authority - they are in effect two separate entities in reality, one run by Hamas and the other by the Palestinian Authority who appears amicable to continued negotiations and establishment of a two-state solution. Painting Israel's security threats as coming from the east, simply because the West Bank is located there or that Jordan is an Arab nation located to the east or due to the obvious, it is Israel's longest border and water flows in this area (aquifers included), is unfair to the people in the region at large. In my final analysis, the article is truly one-sided and for obvious reasons panders to those who might not be as familiar with the regional politics. It leads those who are less familiar with the Levant region to believe that all is true and that all surrounding countries willingly harbor terrorists who fight Israel. I hope that in the future, the Investigative Project on Terrorism will publish more balanced articles regarding this region of the world or at least include editors comments regarding the one-sided perspective. - the Levant is "ground zero" for what the world today understands as terrorism. These groups are not all focused on Israel nor do they have some integrated plan for the future to engulf the Jewish state. I served 29 years in the US Marine Corps, received my Master's in Diplomacy with a concentration in terrorism from Norwich University. My entire course of study focused on terrorism in the Levant. I continue to research, write and publish on the subject. The article seems more centered on geo-political issues that terrorism. Has IPT changed the focus of the organization?